Really? https://www.ebay.com/itm/RARE-1944-GOLDEN-AGE-HEADLINE-COMICS-8-CLASSIC-HITLER-COVER-COMPLETE-/372645658367?_trksid=p2047675.m43663.l10137&nordt=true&rt=nc&orig_cvip=true Seller has ZERO feedback. Foo. Vol 1 # 1 Canadian parody magazine that pre-dates both Mad and Cracked magazine from Sept 1951 with a really cool Anti-Communist cover. 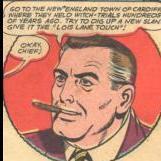 No unseen Triumph Comics # 32 as noted by historians and myself, also a historian. 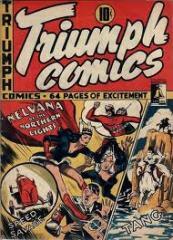 The Library and Archives Canada will also confirm there is NO Triumph # 32, as they have the entire run of Triumph Comics twice. The elusive and highly coveted Nelvana One-Shot compendium from 1945.